Serendipity Blackmagic / Megarip / Veripress version 6.0+ adds the ability to open Serendipity Archive (.sdb) files using native operating system contextual (right-click) menus. 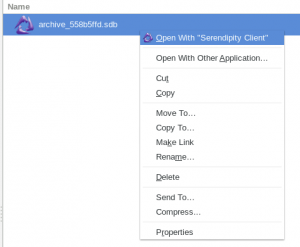 On any computer running the Serendipity Client, select a Serendipity Archive (.sdb) file, then right-click. Preview (Serendipity Client) – opens the selected archive (.sdb) file in an Archives application window in the Client. Open With > Serendipity Client – opens the selected archive (.sdb) file in an Archives application window in the Client. double-clicking on an Archive (.sdb) file. click-and-dragging an Archive (.sdb) file into an open Archive application window.